At 20,380 square miles (52,800 sq. km), the Central Kalahari Game Reserve is larger than some European countries, such as Denmark or Switzerland, and is bigger than Lesotho and Swaziland put together! 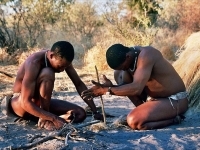 Indeed, the reserve is the second largest game reserve on earth and its sand dunes, saltpans, riverbeds, mopane forests and vast open plains are home to an array of fascinating wildlife species, as well as settlements of local Basarwa or San tribes - an exciting combination of both environmental and cultural experiences for visitors. Address: Central Botswana, just over 200 miles (322km) from Gaborone.